Charles Hanover Didn't Understand the Real Power of the Clock! BACK and forth, back and forth, Charles Hanover paced the broad landing on the upper floor of the old mansion. His glance kept shifting from the closed door of his Aunt Agatha's room to the huge, ornately carved grandfather clock that was solemnly ticking in the corner. Back and forth, tick—tock, back and forth . . .
"Mr. Hanover, sir?" Mrs. Swanson, the housekeeper, had come up the stairs, and now she looked questioningly at him from the gloom of the deep stairwell. "How is she, sir?" Before he could answer, Dr. Brooks came out of his aunt's room. He placed a gentle hand on Charles' shoulder. "It's all over, Charles. She never came out of the coma. Strange that she took a turn like that! I had thought, with proper care, she would go on for years. Still, one never knows with these cases. . . . After all, she was past seventy." "Of course, doctor. I'm sure you did everything you could." Suddenly, with a harsh grating of gears, the chimes of the clock pealed out midnight. Charles whirled around with a cry of surprise. Loud, clangorous, the clock began to sound the hours: One, two, three . . . "Stop!" Charles shouted above the chimes. "Stop it! Mrs. Swanson! Have this clock stopped! At once, do you hear?" Breathing deeply, he regained control of himself. "I—I'm sorry. I'm all on edge." "We understand, my boy," the doctor said. "I'll give you something to settle your nerves, Besides, it's only fitting that the clock be stopped. Your Aunt Agatha set such great store by it." AFTER giving orders for the necessary, arrangements, Charles retired to his room. How quiet the house was! As quiet as . . . as death. For the first time since he had come here, an orphan boy of eight, the grandfather clock was still. He remembered Aunt Agatha speaking about it. "You're going to live with me now," she had said. "Your parents spoiled you. But they're gone now, both of them. In this house you'll do things my way. And don't think you can deceive me! Have you seen that big grandfather clock upstairs? There are little men in it who ring the chimes. They'll be watching you all the time, and if you do something naughty behind my back they'll ring and ring and ring! So mind whatever I tell you. Charles had minded, afraid of the little men in the big clock. Even later, when he grew up and was no longer afraid, he still minded. Aunt Agatha dominated him completely. She chose his schools and companions, ruled his actions, his very thoughts. He had wanted to be a chemist, but Aunt Agatha would not allow it. Why must he learn some vulgar profession? He was a gentleman, and gentlemen did not labor like everyone else. Charles had not cared too much. Aunt Agatha paid his bills, bought him fine clothes, gave him ample pocket money. She could be kind—when she had her own way. But that was before he met Alice—gay and pretty Alice, who thought he was the finest man on earth. When he told Aunt Agatha he wanted to get married, she laughed her dry, hacking laugh. "What! You get married? And to a waitress, at that! Ridiculous, my dear boy!" "But Alice is different! She loves me! She—"
"Pah! Nonsense! She's after the money you'll come into some day, when I'm gone! No doubt you've mentioned that I hold the Hanover fortune in trust for you, and that it will all be yours on my death." "Very Well. I'll leave! I'm thirty-seven, old enough to know my own mind ! I'll get a job!" "Really,, Charles? What can you do? You've no training, no ability, no experience. And how long would you last in a store or office? You're used to luxury, Charles. You're soft and you're weak. No, you'll never leave me. And I want you with me. You're all I have. We need each other, Charles. Now let's say no more about it. I'm willing to forget it if you are." AUNT Agatha had been right. He had not been able to bring himself to leave. But he had not forgotten. He had continued to meet Alice secretly from time to time. He had told her that they could not be married just yet. A few more months, perhaps a year, and he would be in position to marry. And now Aunt Agatha was dead, and he was free. Free to be himself, to marry, to do anything he wanted! Free at last! . . .
Then he heard it again—the chimes of the clock pealing out midnight. With a roar of rage he burst out of his room. "Mrs. Swanson! Mrs. Swanson!" he called. "I told you to have that clock stopped!" He was at the landing now, and Mrs. Swanson's voice came up the stairs: "It was stopped, Mr. Hanover!" "But I heard the chimes!" "You . . . you must be mistaken, sir! There hasn't been a sound in the house!" Charles stared at the clock. It was true—the pendulum was stationary, the hands motionless, the gears and springs silent. "Get me an axe—or a hatchet!" he ordered. "An axe! We must have one in the basement somewhere! Hurry!" Charles remained there, staring at the clock until Mrs. Swanson handed him an axe. While she watched, horrified, he raised the axe above his head and brought it down on the clock. Methodically he destroyed the clock, smashing the case and the glass, scattering the gears and springs. He tossed the axe on the pile of wreckage and turned away, trembling, panting heavily. "Have this . . . this rubbish taken away. Immediately," he said, and returned to his room. Exhausted, he flung himself on his bed and fell into a deep sleep. How long he lay there he did not know, but when he awoke he heard the clock again. The room resounded with the ringing of the chimes. He pressed his hands against his ears, but he could not shut out the terrible sound. He left the room, stumbled through the house, but there was no escape. He shut himself up in the library, tortured by the awful clangor of the chimes. Louder and louder, again and again, the chimes pealed out through the night. It seemed to surround him, to fill the whole world, clanging, vibrating, echoing, peal after peal after peal. It hammered at his brain, crushing his senses. DAWN was breaking when he lurched, from the house. He got into his car, drove furiously to the funeral chapel. The chimes kept pace with him, ringing out in a mad torrent of sound. "My aunt—where is she?" he said to the amazed attendant. "Right in here, Mr. Hanover. But—"
Charles pushed the man aside. He threw himself on his aunt's coffin, clawing,at it, beating on it with his fists. "Aunt Agatha!" he shrieked, Aunt Agatha! Come back! 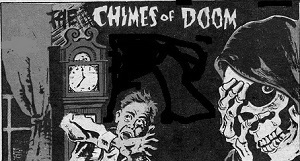 You're,the only one who can stop the chimes! Yes, I gave you an overdose of your sedative! I killed you! I had to do it! I had to be free of you! But the little men in the clock—they saw me! They keep ringing the chimes—ringing and ringing and ringing! Can't you hear them? You've got to stop them! Please! Please! I'll never leave you, Aunt Agatha, if you'll stop them now!" His head dropped, his body shaking with great sobs as he lay across the coffin and clutched Aunt Agatha's cold, lifeless hand. He was still holding her hand when the police came for him. From Adventures Into Darkness, August 1952. Extensive research did not uncover any evidence that the U.S. copyright on this publication was renewed.